A group of flower is called inflorescence. Most flowers develop scorpioid cyme inflorescence. Small flower are inconspicuous. They collect together to form inflorescence to attract insects. The main axis of inflorescence is called peduncle. A long unbranched leafless peduncle arising from the ground level is called scape. Inflorescence may be terminal or axillary. Terminal flowers: In this case, the flower borne at the apex of the main stem or its branch. Example: poppy. The inflorescence may be simple. compound, mixed or special types. 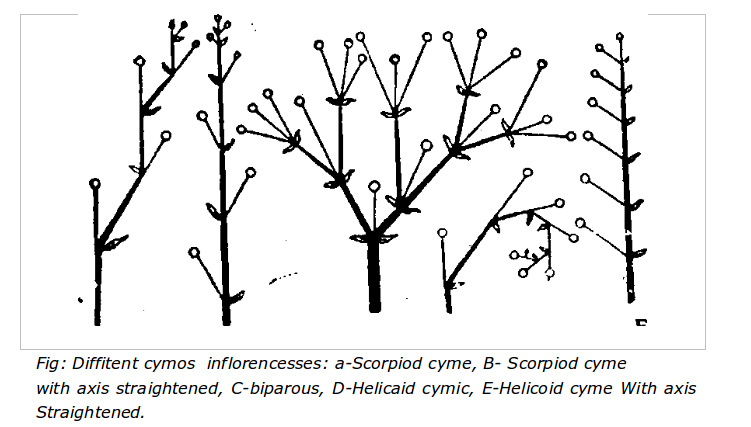 The inflorescence in which branching of the main axis or peduncle is racemose or cymose is called simple inflorescence. The inflorescence in which main axis develops lateral flowers and continues to grow indefinitely unto last flower is called racemose inflorescence. The main axis is monpodial. The flowers are developed in acropetal succession. In this case, oldest flowers are home towards the base of inflorescence hut younger flowers are borne towards the apex. In some case, main axis becomes flattened. In this case, oldest flowers are.arranged towards the periphery and youngest flowers are arranged towards the centre. .[here are following types of racemose in florescence. I. Simple raceme: The racemose inflorescence in which main axis is elongated and beam lateral pedicillate flowers is called simple raceme. Example: Linaria. Corymb: In this ease. 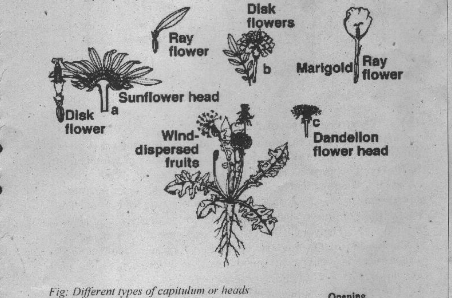 main axis is short and pedicles of the older flowers are longer m it ped ides of the younger Ihmersare short. Therefore. all the fllowers come at the same level. 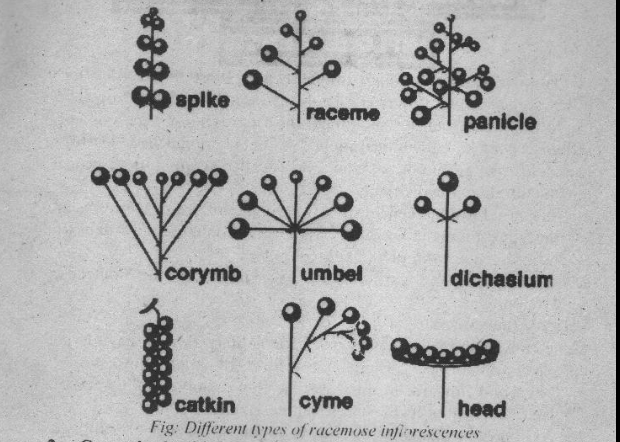 Corymhose raceme: It is intermediate between simple raceme and con mb. In this case. the inflorescence is etay nib in the nok flowering stage. Hut later becomes siMple racetile due to elongation of its axis. Example: Bras–sica. Spike: The inflorescence in which main axis is elongated and hears sessile lateral flowers is called spike. The flowers may be bracteate or ebracteate. Example: Bottle brush, ginger . Spikelet: The dry spike which has one or few sessile flowers is called spikelets. Spike let is urrounded b a special bract at the base called ghillies. Example: grasses etc. Catkin: The spike with unisexual flowers is called catkin. The male catkin falls off as a whole after flowering. b thefemale catkin drops oil after fruitening.Example Mlilberr. Spadix: The special type of spike with main axis thick and fleshy bearing unisexual flowers is called spadix. The large prote2tive bract is known spathe. Example: Date palm . 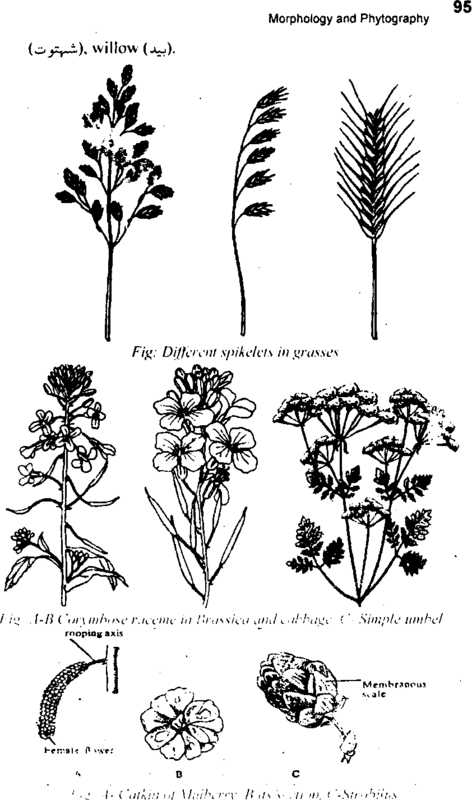 ale umbel: In this case, main axis above the first flower is a short and Mower appears to be arised from the same p it. The younger flowers are towards the centre and the older flowers are towards the periphery. Bract may or may not present. 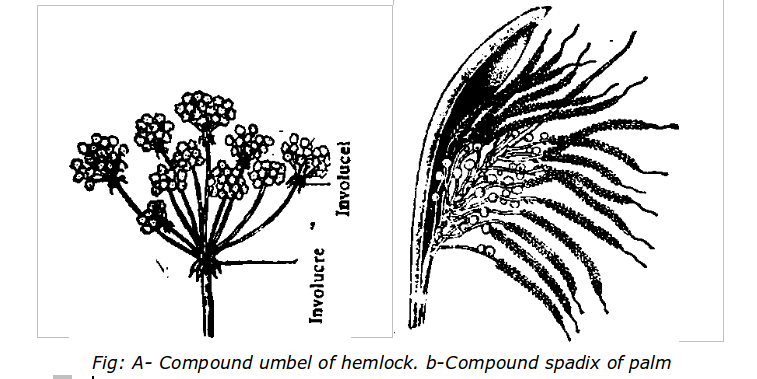 If bract present it forms involucre rounds the base of umbel. Example: cherry, Hydrocotyle. 10.Capitulum or Head: The inflorescence in which main axis flattened to form receptacle and flowers are crowed on it is called capitulum. The flowers are small and sessile. They are called florets. The young florets are present at the centre of receptacle and –older flowers are present towards the periphery. The receptacle has many overlapping bracts at the base called involucre. The flowers May be bracteate or ebracteate. The capitula may be homogamous or heterogamous. Heterogamous: In this case, two types of flowers are present in the capittila. Example: Sunflower. Sunflower has two types of small flowers, disc florets and ray florets. The disc florets are present in the central region. They are tubular and bisexual. [he ray florets are present towards the periphery. They are pistillate or neuter. 11. Hypanthodium: It is a modified form of capitulum. In this case, the receptacle grows upwards along its margin and form hollow pear shaped structure. 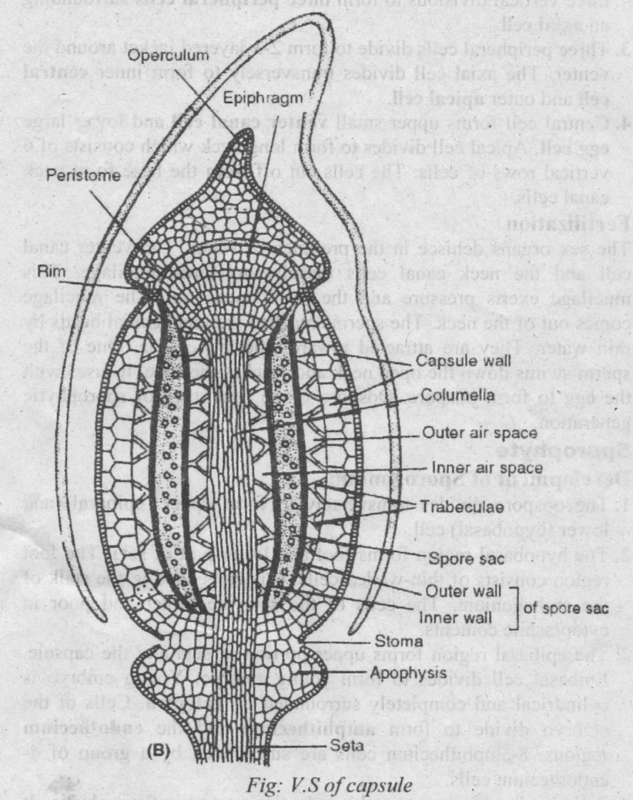 It has apical opening guarded by scales. Unisexual flowers are developed on the inner surface of the hollow receptacle. The male flowers are developed at apex near the opening. Example: peepal banyan. in this inflorescence the main axis soon ends in a flower. It gives one or two lateral branches or daughter axis, each of which ends in flower. This process repeated several times. The daughter axis arises in the axil of bracteoles. The flowers are borne in basipetal succession. In this case, the terminal flower is the oldest and the lateral flowers are younger. ‘Elie flower forms clusters in cymose inflorescence. The young film\ crs are present tmsards the periphery in cluster and old flowers are present in the central region. Such arrangement is called centrifugal. C muse inflorescence may he uniparous, biparous or multiparous. Scorpioid cyme: In this case, new daughter axis develops alternatively, i.e. right and left side. Example Henbane . Helicoid cyme: In this case, new daughter axis develops on the same side. Example: Begonia. Biparous or Dichasial Cyme: In this case, the main axis ends in a terminal flower. It produces two daughter axes below this terminal flower. The daughter axis again ends in a flower and each gives two nev daughter axes. This process repeated several time. Sometimes, one of the two branches suppress at some point., Therefore, the biparous becomes uniparous. Examples: Ipomoea. strawberry etc. I. Compound raceme Or Raceme of racemes: In this case, main axis is racemosely branched and branches develops pedicillare flok‘er in a racemose manner. Example: Delphinium. Ao irregular branched raceme is called panicle. Example: Yucca. case, main am of the inflorescence bears small or spikelets. Example: wheat, barely etc. Compound umbel or Umbel of umbels: Branched umbel is called compound umbel. The branches arise from the main axis form primary umbel. The flowers arise from each branch forms secondary umbel or partial umbel. Bracts may be present. If bracts are present at the base of primary umbel, these are called involucres. If bracts are present at the base of each secondary umbel, these are called involucel. Examples: Carrot. Coriander. Raceme of capitula: In this case, main axis is branched in a racemose manner and each branched terminates in a capitultim. Example: Erigeron. In some inflorescences, daughier axes are suppressed. So the flowers are crowded together in several groups. It is difficult to determine the type of infloreseence in them. Therefore, they are called special inflorescences. It has followimz types: . 1. Cyathium: It looks like a single flower. But in reality, it is an inflorescence. Many axes are reduced in it. 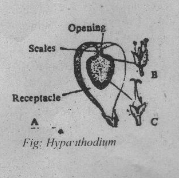 Complete suppression of sepals and petals occur in flowers. flower ripens first and then male ripens. This order of development is like cymose cluster. Example: Ettphorbia helioscopht. 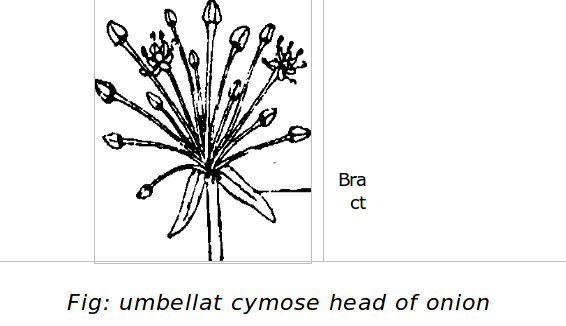 3.Umbellate Cymose Head: It is found in onion and garlic In this case, a long leafless stalk or scape arises in the midst of radical leaves. This seape bears cluster of flowers at its upper end. These flowers appear to form umbel. But in reality, they form helicoid cymose clusters. 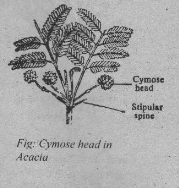 Therefore, such type of inflorescence is called umbellate cymose head.